that are already using a Business SMS service are not using it as a truly unified solution. Currently, companies provide their client’s with a random, irregular 5-digit number that produces canned responses which consequently end with the customer calling into the business for support. 90% of leads would rather receive a text message than a phone call. 50% of consumers would rather text for customer support then call if given the option between the two. 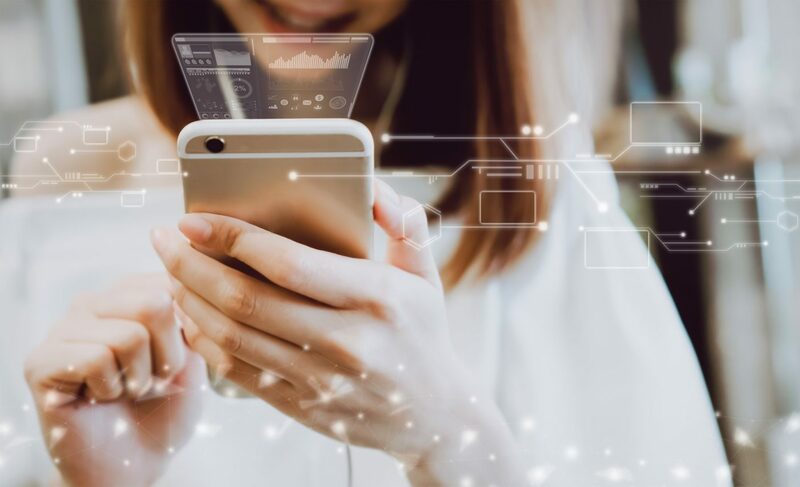 ACC Telecom understands that in order for you to be competitive in the marketplace you need practical, simple, and cost-effective SMS solutions to meet your customer’s evolving communications needs. As such, we offer a variety of Business SMS text messaging services including SMS-to-Email, bulk Outbound IVR SMS, and Omni-channel Contact Center integration. Our most popular Business SMS and Business MMS service can be activated on virtually any U.S. or Canadian phone number, DID, or toll-free number so you’ll maintain a unified, professional identity by using your existing phone numbers. SMS/MMS activation has no effect on the voice services of the phone number, so it is completely transparent to your customers! 90% of SMS Messages are read within the first three minutes. The average response time for an SMS message is 90 seconds, whereas response times for email is 90 minutes. 75% of all millennials would rather communicate via text about appointments, scheduling, support, deliveries, coupons, and the like. Our most popular form of Business SMS allows your clients to text your business phone numbers directly. Inbound text and picture messages arrive in your employees’ email inbox and allow the employee(s) to respond to the text messages via email. The customer receives the response as a text message. Click here for a sample message. Our Artifical Intelligence SMS Keyword Responder Bot automatically replies to inbound text messages by incorporating keywords, your company directory, and Auto Attendant. 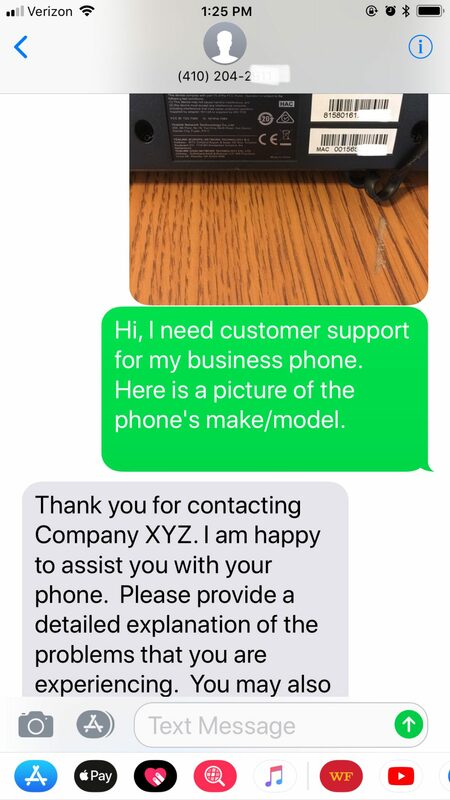 For example, if a customer texts the keyword “customer service” to 410-995-0101, the SMS Responder Bot automatically replies, “Thank you for texting Company XYZ. I see you’ve spoken with Carly in Customer Service previously would you like to speak to her again?” If the customer replies “Y” for yes, the system connects the customer and Carly via call control. Click here to view additional examples of how our A.I. SMS Responder Bot can enhance your business communications. Transform your voice-only call center into an omni-channel contact center powerhouse by incorporating Business SMS, Automatic Call Distribution (ACD) SMS, ACD email, WebChat, social media, CRM integration, CBIQ (Call-Back-in-Queue), and more. Allow your customers to contact your representatives via text message for a complete communications solution. Text message conversations are stored securely and conveniently in the customer’s account for easy retrieval. Broadcasting is a form of ‘outbound’ IVR that allows businesses to broadcast text messages via campaigns to pre-determined group lists that have been uploaded to the IVR platform. Why should I implement a SMS Text Messaging Solution for my business? Texting provides a simpler, better customer experience for providing quick answers or updates such as payment confirmations, product availability, shipping alerts, and scheduling appointments. Data shows that more than half of consumers would prefer texting with customer support over other methods (eWeek). What is my phone numbers are with a different carrier? We can port (transfer) the SMS portion of phone numbers without impacting your calling services. Any phone number, with the exception of wireless numbers, are eligible for this solution. Does this service support MMS (picture & video) messaging? Yes! MMS messaging is supported on inbound & outbound messages depending on the SMS solution you choose. MMS messaging is widely used by service companies for quoting purposes. For example, a local landscaper has clients text pictures of their yards for service estimates– eliminating costly (and frustrating) travel time. How do other businesses use Business SMS? Businesses use our SMS services for appointment scheduling, customer service & support, pricing information/quotes, daily specials, hours of operation, shipping status, payment questions, and so much more. The possibilities are endless. Can I allow texting on my toll-free numbers too? Yes! Customers can text your toll-free numbers, main business phone numbers, and DIDs (direct dial phone numbers). Implementing Business SMS and Business MMS allows you to enhance your communications channels, grow with the industry and provides a competitive advantage. So what are you waiting for? Contact ACC Telecom today for your free business text messaging consultation. ACC is an authorized Business SMS provider and serves businesses throughout Maryland, Washington DC, and Northern Virginia and beyond. Contact us today to learn more about our business communications solutions.